Sandbar hasn't spoken enough on the comic pages at this point for too many people to have caught on past a reasonable doubt, but at the table, heard in-person, it would have been much more noticeable. Also, Silverstream squawking angrily is adorable, and with Pinkie's frantic angry voice even moreso. Couldn't resist. I hoped you had a happy Me day yesterday. So, who here did something? Surprise: Yesterday was completely boring. Your worst nightmare! About half of my Discord chatrooms changed their server icons to have the notification ping built into the artwork. Honesty doesn’t mean spilling every little secret. Especially when that secret is just a little good harmless fun like teasing your friends with a little mystery. Especially one clearly indicates that it's a secret rather than just not letting anyone know that there is information they don't have. She probably did lie when she said, "I have no idea what you all are talking about." She's not playing Applejack right now. Yeah, but the player has consistently had that accent no matter how deeply out of character the conversation has gone, until now. And... Canon Applejack has demonstrated that she /can/ do a "Manehattan accent"
Which made sense as she spent time living there with Aunt & Uncle Orange. Continuity! A long time back I needed an "exotic" accent for a fantasy larp. I settled on a romanticized old western drawl and I played that character for several years. Still southern even if she doesn't show the accent. "You all" is mostly common where it would be shortened to "y'all" anyway. Most other places would say "all of you" or just the collective "you." Someone needs to take the 5th panel and turn it into an "Angry hippogriff" meme. 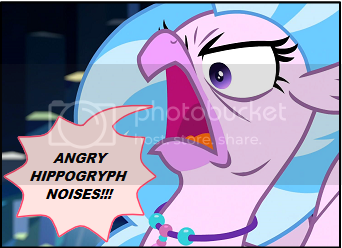 "Angry hippogriff noises" that is. Don't worry about it Harry, just go there and ignore the bleeding Malfoy, she will not kill you. Sure, maybe you could be hurt but that is not important, right? When someone change to adapt into another character and everyone ask... What is the true? Any story about it? Many a year ago, back when I started doing Vampire LARPs, my first character at a particular game was a Nosferatu with a hunchback. And I consistently spent all my time in-character with my shoulders held at a weird angle to simulate it. Consistently enough, apparently, that after a month or two a player I didn't know particularly well freaked out when he saw me walking around normally in an OOC area. Apparently this was the first time he'd seen me out-of-character and up until that point he'd assumed there was actually something wrong with my back. "... What happened to your hump?" Hy ken pretty moch fall into de Jäger accent from de Girl Genius vebcomics vitout efen really tryink. Iz moch easier to speak it then to type it ov courze. One of the players in my group loves to give her characters exaggerated accents, and she did the Jager accent for her fighter in a 5E game we started. We play via Maptools chat, BTW, so yeah, she was typing it all out.